The 40mm/2.8 seems to be the smallest lens one can make. Also, why are f/2.8 lenses small and lightweight, but get larger and heavier as they get wider or narrower? Are these two things by physical limitation or by design? By design long long ago? If by design, by which part's design? By whose design? It's to do with the backfocus distance, that is, the space between the back of the lens and the sensor. 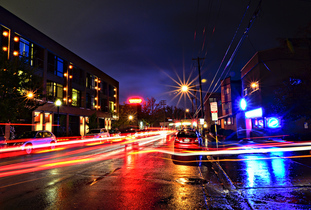 When this distance is greater than the focal length a simple symmetric lens design can be employed. The backfocus distance on a regular 35mm SLR is about 40mm. To make a wide angle lens with a symmetric design the back of the lens would have to be closer to the sensor, which wouldn't leave space for the mirror. So it has to be further away with a reverse telephoto group stuck on to make up for it. This is known as a retrofocus design. Now you have two lenses in one, instantly increasing the size and weight. There are other factors too, such as the extra corrections required for wide rectilinear lenses due to the use of spherical lens elements. Actually, a lot of the individual lenses inside a modern camera lens are there to correct the optical imperfections that the other lenses have introduced. If you are willing to make some compromises in absolute optical quality, a lens can be made smaller and lighter than if you have higher demands. 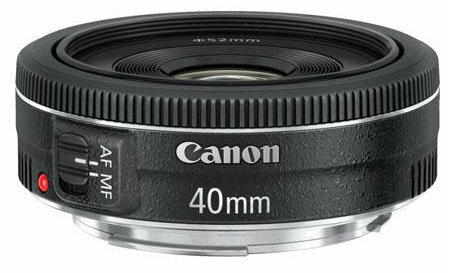 Also, the Canon 40mm is one of a family of lenses called "pancakes", in which compact size has been the overriding design requirement. Pentax seems to have made a habit of such lenses and makes them in 21/3.2, 40/2.8 and 70/2.4 variants. Other manufacturers have the odd one as well, but it is a niche product for everybody but Pentax. Another point is that due to the mirror-box of an SLR, wide-angled SLR lenses generally have to be designed as "retrofocus" ones which basically means that you bolt a tele lens on to the camera side of a wide-angle lens. Which makes it a lot bigger, naturally. Camera systems such as Leica M where the lens is mounted much closed to the film plane can have wide-angles without the retrofocal bits, so they can be made much smaller. What is the difference between these lenses? Why did typical number of iris blades decrease from the 1950s to the 1970s and 80s? 1960s-1990s third party lenses - why was the “lowest tier” cheaper to make?